Most people easily consider that the fire itself is dangerous, which of course is accurate, particularly if you’re undereducated about how to handle and extinguish it safely. If they are people that are qualified to be performing, we also hope they are considering other things that go along with that like placement of the depot, spin off, distance to the crowd and other elements of fire safety. These things have been written about tons and we even have our own fire safety manual in PDF format free for download you’re welcome to acquire. Your ego. You’ve spun countless times. Nothing ever happened before so why bring a safety? You think you’re badass and an accident can’t or won’t happen to you. You know what? I’ve seen some of the most badass spinners have the most crazy experiences: forgetting to take a synthetic coat off before stepping into the performance area; tools catching on earrings and ripping earlobes off; getting hit in the eye and scratching the cornea; tools not spun off spattering fire on the walls; tools breaking and fire flying in an uncontrolled manner; the artist’s back catching on fire. All of these things can happen to you because accidents do happen. Audience ignorance. If you’ve been spinning fire long enough, you’ve likely heard this question (or something like it) posed, “Is that real fire?” Its amazing how many people think it’s a trick of the eye or somehow mimicking fire but not actually fire. 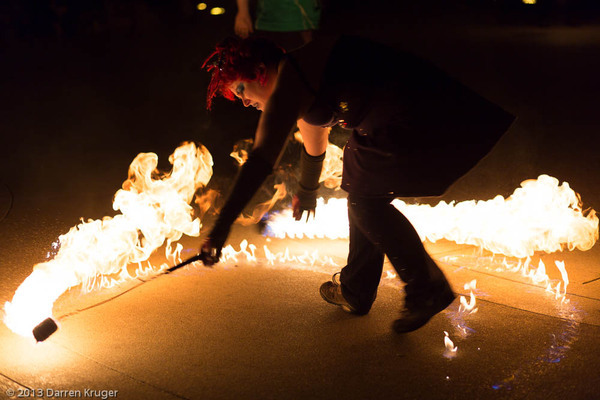 Imagine… you have audiences who may or may not even believe you’re spinning fire rushing the stage much like an audience might at a music concert and suddenly, unbeknownst to them, they are doing things that are risky. The reality is, many people aren’t aware of what is and is not going to melt to their skin. A drunk or high person can (and many will) be even more carefree and subsequently, with open, unguarded stages, such people walk into your performance area and mess with your flow while risking melting their clothing to themselves. Now if you had a barricade, they would be less likely to rush you, but make no mistake about it: audiences rush performers with fire when there’s no barrier. Do not trust your audience. They truly do not know what they do not know. The Internet. As amazing and powerful as the internet is, it’s equally scary because there are no safety warnings and no guarantees what you saw on the internet was real, fake, safe or not. As a result, people see videos and get the impression things are okay to do that may only be okay after appropriate training. For one thing, it’s often difficult to discern the safety protocol (if any) being used by an artist in performance videos. If you’re new to spinning, you probably don’t even know there is such a thing as a safety protocol so when you watch some videos, you may think all you do is light it on fire and you’re set. After seeing a bunch of videos where people are fine, people mistakenly get the impression that there is little risk. For the educated and trained artist, that’s accurate whereas for ignorant and unskilled artists, not so much. Your passion. If you want to perform (and possibly get paid) and that’s more important to you than anything else, you may take gigs because of your desire for either the performance itself or the perks (like pay) that go with it or even both, even if the venue isn’t a safe venue or the situation doesn’t include a reasonable egress plan in the event of an emergency. Remember, if you fling a tool into a crowd where there is no exit path and someone gets burned, scared, disfigured or worse as a result, not only do they have to live with that, you do as well. It doesn’t take that much effort to consider safety protocols and in the end, it’s worth it. Ignorant clients exist and it’s our job as performers to set the standard to protect the client, venue, audience and ourselves as artists. Just because they ask doesn’t mean you have to say yes to the gig. If you’re interested in understanding how to better negotiate your contract, how to work with clients more effectively and generally want to develop your business so you have greater awareness and protection for yourself, consider our upcoming Building Your Business (and maybe even our Flow Instructor) training and get the ongoing support you need to build the business skills to support your performance career. Class starts next sunday over Google Hangouts.